This is a very funny Argentinean action movie. The main character, Mr. Silverstein infiltrates a government building without a clear plan. Soon, everything becomes a mess and he has no other option but to walk on the building's ledge. What is he faced with? Angry birds.... more specifically... angry pigeons. 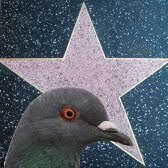 I think that the movie production quality is good but the pigeon appearance should be improved. Clearly, it was recorded in a studio with domestic pigeons. The pigeons are physically thrown against Mr. Silverstein. It is dramatic -especially for the pigeons that seem to be scared- but it is not very realistic. Anyway, the scene is good and creates tension in the spectator. Pigeon activity: Flying close to the main character. Symbolism: There is little symbolism in this scene. The pigeons are presented as urban animals whose environment is invaded by Mr. Silverstein. For these situations, the normal behaviour of the pigeons is to be afraid and escape. However, in this movie they are thrown by force against Mr. Silverstein. 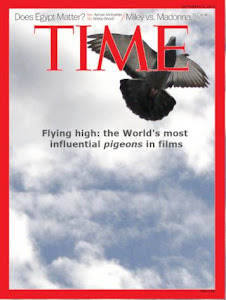 Relevance for the movie: The pigeons almost kill the main character!! Training level: Medium. The pigeons are well trained but are not properly managed.